AW Windows are providers of high quality, high security, double or triple glazed products in glass, plastic (uPVC), aluminium or wood. 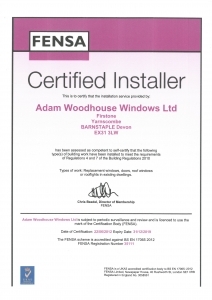 The company is FENSA Registered (35111) and provides a 10 year insurance backed guarantee as standard, giving you the confidence that you will receive an excellent service and quality product. All of our products are made to measure and come in a wide range of colours and styles, they are also energy efficient and are designed to retain heat which in turn will reduce the amount of energy you use and your heating bills. We offer a Bespoke Design Service & a repair service where possible. If you have a project in mind or would just like to talk through some options please do get in touch. 'Supply & fit' or 'supply/fit only' service available. AW Windows can provide a national service to the UK and Channel Islands. The main areas we cover are Bideford, Woolsery, Hartland, Clovelly, Bude, Torrington, Holsworthy, Hatherleigh, Okehampton, South Molton, Lynton & Lynmouth, Barnstaple, Yelland, Fremington, Bickington, Exeter, Chumleigh, Honiton, Exmoor and Dartmoor.